Sizzling with sensational shades of hot pink and highlighting many flower favorites, this feisty bouquet will be a hot topic at anniversaries and bridal showers, on date night or any special occasion. 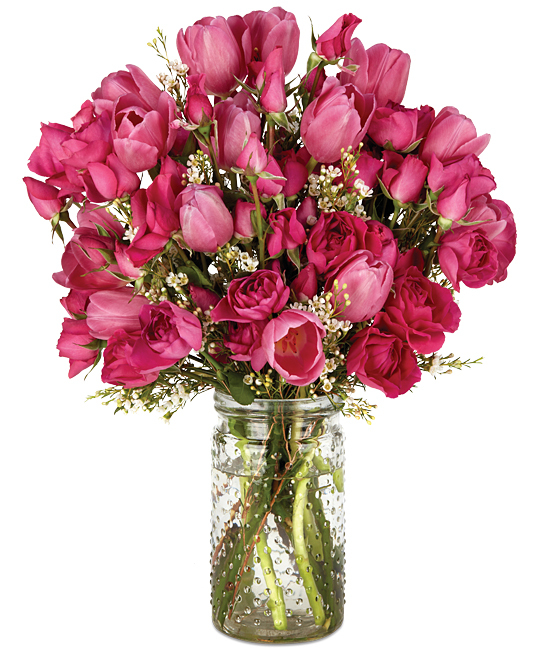 Featuring tulips and spray roses in passionate pink and white wax flower peeking through with hints of pretty white. Our charming glass hobnail jar does a perfect job reflecting the glow of color. Remove all foliage and thorns that will fall below the water line. Allowing them to decompose in water will allow harmful bacteria to shorten the life of the flowers. Remove the “guard petal” on each rose – this is the outermost petal left on to protect the bud during shipment. You may also remove any petals that may have slightly bruised during shipping. We recommend cutting rose stems underwater at an angle for best results. Flowers last longer when kept in deep water. Roses will take up to 12 hours to hydrate. Always add fresh water daily. Change water at least every couple of days. Cloudy or discolored water can indicate decomposition and bacterial growth.